Once there was an old Head Chief in Red Lake. It’s also a little known fact that he walked 150 miles to talk to Bishop Whipple to enlist his help in being an advocate in keeping the reservation together. He was also given a flag with 38 stars on it by Abraham Lincoln. Family legend has it that among other children he had a son. His name was something like “Maydwaygwonon”. Now don’t quote me on that one because I’m still researching it and haven’t verified it, but that’s what dad told me. I’ll explain further down. M. had a son called “Naytawaykaybenais”. 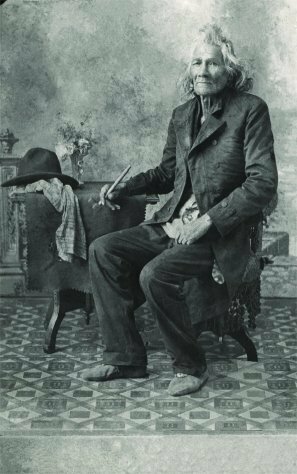 Naytawaykaybenais was his personal name but people knew him as “the man who lives by a littlecreek that dries up after the spring”. For those of you on the reservation, he lived somewhere by Mud Creek coming out of Chain O’ Lakes nearer to Redby. I suppose that is why pop always had an affinity for those lakes and spent a lot of time hunting, fishing, and logging around them. Family legend also has it that since the census takers could not fit this description of Naytawaykabenais all on one line, they shortened it to “Littlecreek” and that is how our surname came to be. This was also when the Episcopal missionaries first contacted him and his wife and his name Jacob Littlecreek came about. Now, one census lists the parents of Jacob Littlecreek as “Unknown”. That is why I mentioned not to quote me in the second paragraph. This is a key point in the differences between oral tradition and written records. I’m working on trying to verify this family legend in written records. His first marriage was to a woman named Kahmajebeeget. They had two kids named Ogubayowon and Quayzence. These two kids would be half relatives but trying to tie them in is difficult. There is a Minnesota death certificate which lists Catherine Whitebird’s mom’s maiden name as “Annie Littlecreek”. I’m still trying to find paperwork which links Annie to one of these two children. His second marriage was to a woman named “Oombwaygeshigoke”. Family legend has it that either she or Magabow—Jacob’s mother—was a member of the Midewiwin’. Subsequent censuses listed her as Louise Littlecreek. Their children were Tishbishcoawan, Jerry, Jane, Elizabeth, George, Benjamin and “No_name”—which was given when a child died stillborn or died very young. Another story was that because of their notoriety a certain number of men of the tribe arrived singing when Kaywinini or “Maker of Iron” (Ben) was born. I believe Magabow was the one who dreamed and prophesied that he would grow up to travel and visit heads of state. Here is my favorite picture of him with one of those important people (at least I think so!) 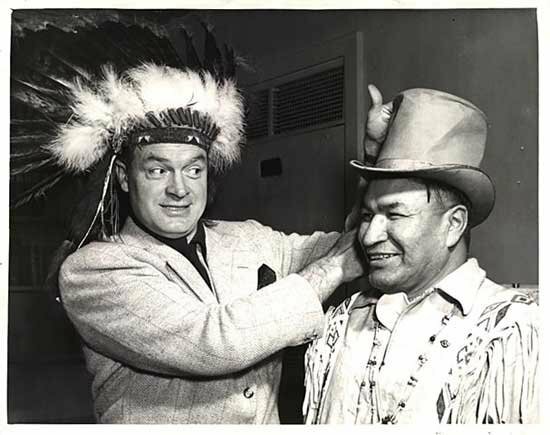 Yes, I know Bob Hope was not a head-of-state; but he was cool. I actually have a letter from Bob Hope replying to a request about more information about this picture! In his lifetime, Ben set up a trading post in Itaska State Park at the headwaters of the Mississippi. With the money that he made during the summer, he would travel to other countries and again family legend has it, he did meet heads of state. Ben said that he was “a keeper of the sacred drum of the Midewiwin”, and that he had returned this drum to the tribe before his death. 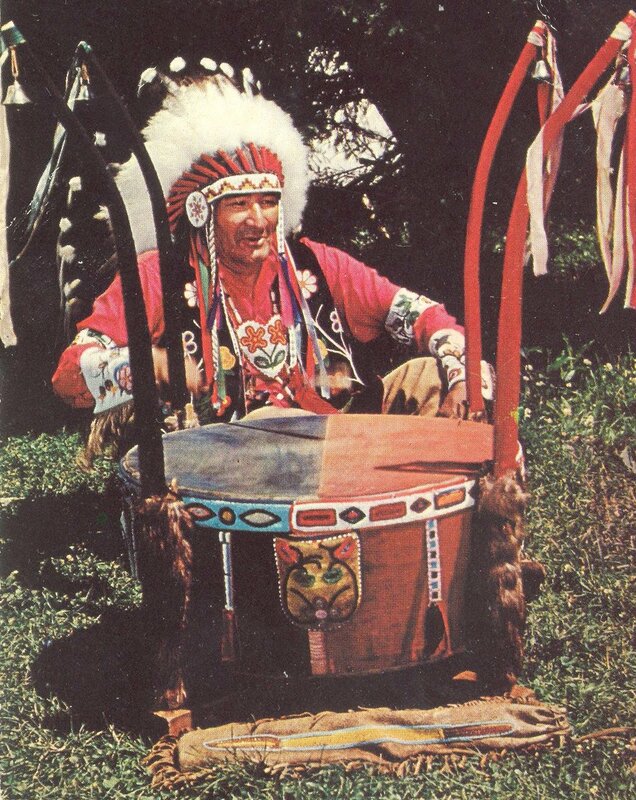 Here is a picture of him with said drum. Much of Ben’s collection of his Indian regalia, now resides in the vaults of the Museum of the Minnesota Historical Society. Now let’s switch scenes to another reservation. There was a Chief named Kaybayahmahjewaib who was born in Mahnomen. He was also known as Chief James Mason. He married Ogubaince. Her maiden name was Mountain. She was born in 1855 in White Earth. They had at least two sons, one named Thomas and the other Charles. Here they are at Carlisle Indian School. They knew Jim Thorpe during their senior year. Thomas married Waleya who also was from White Earth. They had eight children. The second oldest but oldest girl was Elisabeth “Lizzy” Joyce Mason. 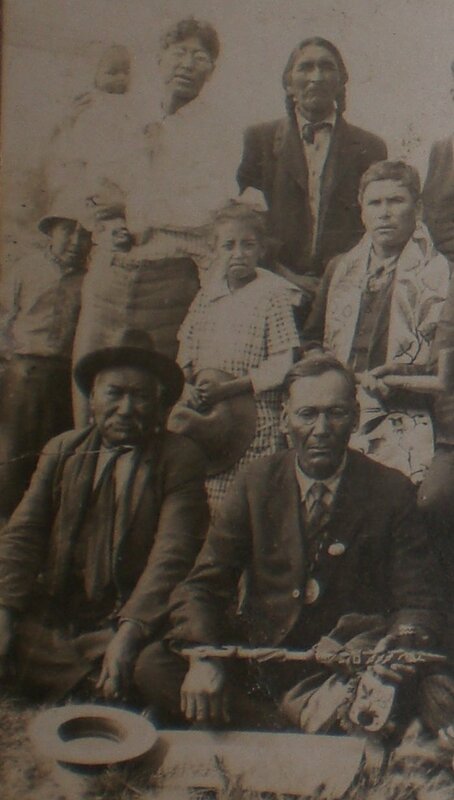 Lizzy as a 14 year old visitor with dad and sibs at the July 13-15 1920 meeting of the "Chippewa Indians of Minnesota Incorporated" at Ball Club Minnesota. You can see her with her father in this group picture at the time. I found it in her shed after Lizzy died. Elisabeth was an imposing and interesting woman. She struck me as the strong silent type. She did a lot of beadwork, smoked like a chimney, and kept her house so warm that you started to sweat as soon as you walked into it. Sometimes she would use phrases like “You done me dirt.” Other times, when I was a kid, she would slip me a dollar when no one was looking to go and buy candy . One day she met Kaywinini (Ben) and they were married (she for the 3rd or 4th time, he for his first time). My dad, Ajiidamo –which means squirrel, because he was named after “old man John Squirrel”–came into the world about a year later, and a year after that, Lizzy and Ben divorced. And just like that, many of those connections to the past, religion, family history, and culture, were impaired. Ajiidamo would join the army and go on to marry a woman whom he met while roller- skating on Army leave in New York City in 1948. Kaywinini did not show up on Ajiidamo’s doorstep until at least 24 years after he and Lizzy were divorced. Ajiidamo didn’t talk much either. So my impression of him was that anything that he learned about being one of the Anishinabeg he probably picked up on his own or from Red Lakers when he lived on the reservation, or at the American Indian Center when he lived in Chicago. My experience with him was that he learned things as he went along. Take this with a grain of salt. Most of this comes from the perceptions of a child or young man watching a father without access to his thoughts, or access to his father’s experiences outside of the family. As Anishinabeg, we all have a story. It is what makes us Anishinabeg. It just so happens that since there are many paths to becoming “The People”, our stories are different from each other. Some stories are about Red Lakers blessed to have the most unbroken lines in their history. A few are about Red Lakers who have no apparent history. Many stories, like mine–rest somewhere in between with varying degrees of misery and happiness. The point of all this, is that no matter how poor or rich your family story, it can be richer. Many of the above family facts were found by searching treaties, tribal roles, censuses, historical correspondence, birth, death, and marriage certificates etc., in addition to what was passed down orally. Wanting to help, I downloaded the census images for the people living on the Red Lake Reservation at the time and created a list with each person’s name and a reference to the particular image where you can find your person’s name. This way we can trade. You can come to my blog site and search for family–and your visits will provide me with more hits on my blog! We will both be winners! I’ve printed the list below. You may copy the list for your own use but you cannot re-post or commercially reprint it on or off the internet without my written permission. I would like people to revisit this site to help with my numbers! For this reason I have Copyrighted the list. Once you are at the list, all you need to do is use your Browser’s “Find” function to search the list for the names in which you are interested. I tried to be accurate in transcribing the names as the census takers recorded them but there are probably rare errors, so you might want to try various spellings of a name. The census image groups families together naturally so as to make it easier for you to find your family if you know the names of the parents and siblings in cases where your family name is common. After viewing your images, please let me know if you find errors and I will be happy to correct them! GOOD HUNTING and best wishes! P.S. MN refers to the state of Minnesota. ED = Enumeration District and the number at the end doesn’t really appear anywhere. It only refers to the position of the image in the series in that enumeration district. The actual image name is different than the image number. This is an awesome story. I found all my grandparents and their siblings on this roll. Very neat stuff. Also, about that 38 star flag, is there any more information besides Abe Lincoln giving it to our tribe? I am curious to know who had this before me. My grandfather Clarenece Leo Stately passed this flag down to me when he passed in 2005. I know John Fairbanks was the one who gave it to him but I am unaware of who had it before Mr. Fairbanks. if you have any further information, that would be great. I have always looked for information about this flag on the internet but I came across nothing. The only thing my family could tell me was the name of the man who had it before my grandfather. I am still looking for information to this day. I appreciate your prompt response and enjoying reading all your writings. I too write occasionally, mostly poetry. I was curious and did a little digging since your first response. I searched “familysearch.org” for a John Fairbanks who was born in Red Lake. This led me to a John Fairbanks whose mom was “Fanny Stately”. This made me wonder if there was a relation, and upon further searching through the US 1920 and 1930 Censuses, found that both John Fairbanks and Roman Stately’s mom was Fannie Stately, aka. Fannie Fern Paygoonce Aitkin. As you may know, Roman was father to Clarence. Further research into John reveals that he is John Wainding Bigstar Fairbanks. A look at some of his information on this page: http://www.ojibwe.info/gendat/nms_392.html shows that he was one of the people listed as part of the Old Chief”s village. The old chief being Maydwaygwanonind. I know from my research that the old chief was quite the Episcopalian. As you can see on the above mentioned page he was one of the sponsors for John Fairbank’s baptism. 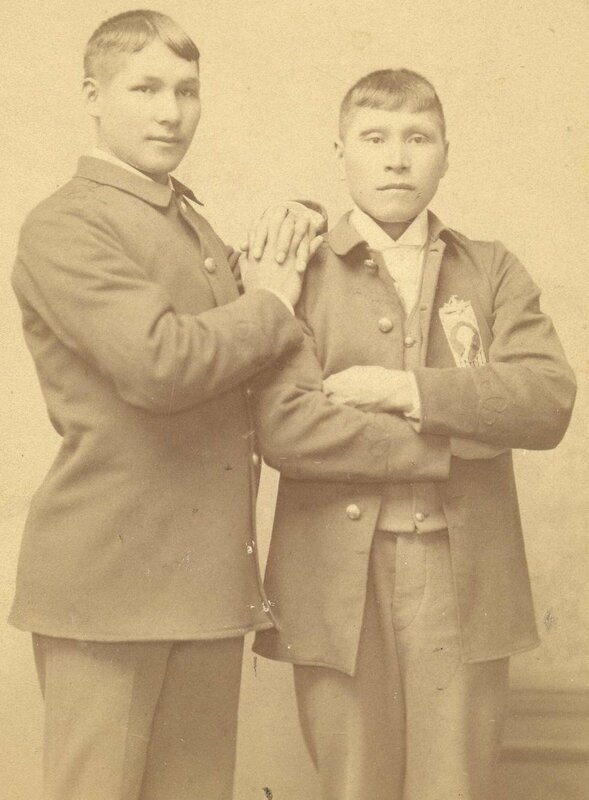 I don’t think John was old enough for Maydwaygwanonind to have given the flag to him personally (although he could have) but his father Charles, William H Fairbanks was–from looking at his profile (http://www.ojibwe.info/gendat/nms_385.html#0I6804)–probably someone who Maydwaygwanonind knew personally through St. Antipas church. So I’m guessing that Maydwaygwanonind gave the flag to Charles, and Charles gave it to his son John and so on to you! Thank you for reading me, and keep writing that poetry! Wow! What a lot of work. You are quite a historian. It’s worth it if even one person can develop even a part of their family story out of it! Thanks, I felt good doing it. And your passion shines through! Looks like we are distant cousins! Here’s a metal photo of James Mason and pics of his pipe and Ojibway Bible (they are in a safety deposit box after being in a closet for decades). I also have a small box of photos of unknown persons – only 2 or 3 have names. Hey Cuz! These are way cool. Sorry I took so long in getting back to you. I just noticed this! You should post copies of your small box of photos on the web somewhere. That way other people can see them who might be able to identify them. You never know! I’m looking for where my grandfather’s last name came from–BENAIS? He was George Benais. There so much Id like to learn. I, too, am a relative of Maydwaygwanonind. He is my great grandfather (x4). I really enjoyed your Hero article and I feel honored to be descended from such a great man. I was really interested to know that his burial site was listed. Do you have any idea where the little log church might have been? I know the elements may have reclaimed it, but I would really like to look into it further. The old log church is gone, but the newer one is still there. Maydwaygwanonind’s grave and tombstone are still there in the middle of the Episcopal Cemetery next to the highway in Redby.